I already write a post how you can easily get rid of the annoying post from your Facebook friends by unfollowing them. Well, in this article you will learn the opposite. If you really want every update of your friends to be visible in your news feed or get notified everytime there’s an update, you can easily achieve that by adding your friends in your close friend and enable notifications for his/her update. 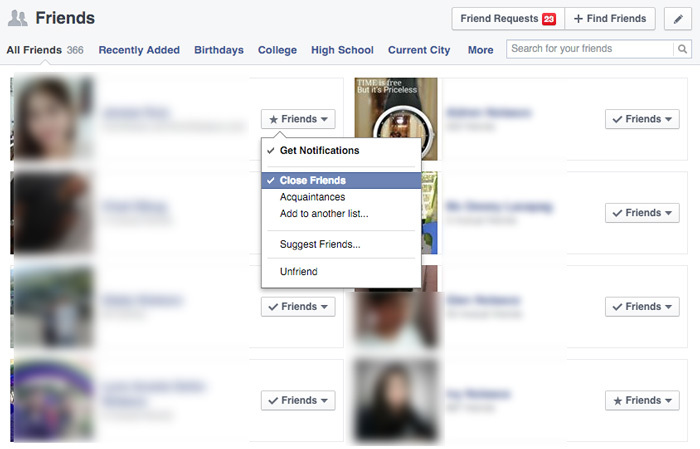 Here’s how you can add friend in your close friends. Using your browsers, go to your profile, select friends to reveal the friends page, from there, select the friends that you want to all the updates. Beside their profile picture and name there is a “Friends” button with a check, click on that button and check the “Get notifications” and make it “Close Friends”. After you added your friend into close friend, you will now see that the check symbol on the friends button become a star. To easily access your close friends list, you can add it to your favorites, on your Facebook home, scroll down to the friends sections, then click more link. On the friends list, find the “Close Friends”, click the gear settings on the far right then select “Add to Favorites”. Now your close friends list is available in the favorite menu.